“Never again”… words we often hear in the face of tragedy and horror, holocaust, and genocide. Words Ms. Jennifer Davis heard from her German grandmother and parents as they recalled the horror of the Nazi Holocaust. This young Jewish girl, born in South Africa from a German mother and a South African father, was able to transfer the passion and power of those words to the tragedy and pain of apartheid in her country during her formative years. For Jen, “’never again’ meant that every Jewish person should be an activist, resisting religious and racial oppression wherever it occurred.” During her years in secondary school and university studies, she engaged in organizing efforts to rid South Africa of this injustice. After she married and her young family moved to New York, she became the research director and later the second executive director of the American Committee on Africa, based in New York. She retired from that in 2000. Now that she is in Washington, she has been engaged with many other African activists, continuing the task of advocating in clear and uncompromising language that justice be done in Africa. Yet, she still keeps ties with colleagues in New York and South Africa, monitoring events as they unfold. She stays connected, and through her, we are connected. 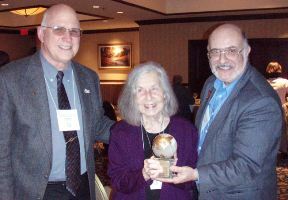 Through her work with the Washington Office on Africa, on its board and as interim director, she became involved in the planning and execution of the Africa Track at Ecumenical Advocacy Days each year. 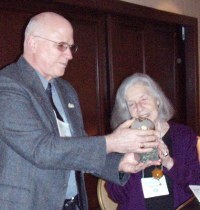 So it was within the context of this year’s EAD that AFJN honored and publically acknowledged Jen with the 2009 Faith and Justice Award at a special reception on Saturday evening, March 14th. She prophetically embodies characteristics of faith, collaboration, and being “an instrument of education and advocacy on behalf of justice for Africa.” No one can doubt her conviction to seek secure relief from systemic injustice in any form. Her indomitable spirit has been a gift to all of us involved in the preparation of the Africa Track each year at EAD. She is our memory (she keeps us from repeating ourselves year after year), she keeps us focused (lest we stray from what really needs to be offered in a workshop or plenary), and she holds us together. The bestowal of this award is AFJN’s way of offering our admiration and gratitude to Jen for her passion and work. —Rocco Puopolo, s.x.